The Ayran cup of the dairy cooperative “Bayerische Milchindustrie eG” (BMI) has been awarded the 2018 German Packaging Prize. The packaging impressed the jury with its successful overall concept in the “Design + Refinement” category – with the idea and implementation originating from Greiner Packaging. Kremsmünster, September 2018. In Turkey, Ayran, a refreshing salty yogurt drink, is traditionally consumed in a type of copper cup. The plastic cup with the hammertone look reconstructs this traditional drinking vessel and makes it stand out on the shelf while at the same time emphasizing the product features through its design. This fact was also appreciated by the jury of the German Packaging Prize. According to the experts, the new design attracts a large target group for a traditional drink, with the white color of the cup and good handling underlining the successful overall concept. Greiner Packaging is the creative force responsible for this: In 2015, BMI approached Greiner Packaging with a request to give its popular Ayran drink a new look. 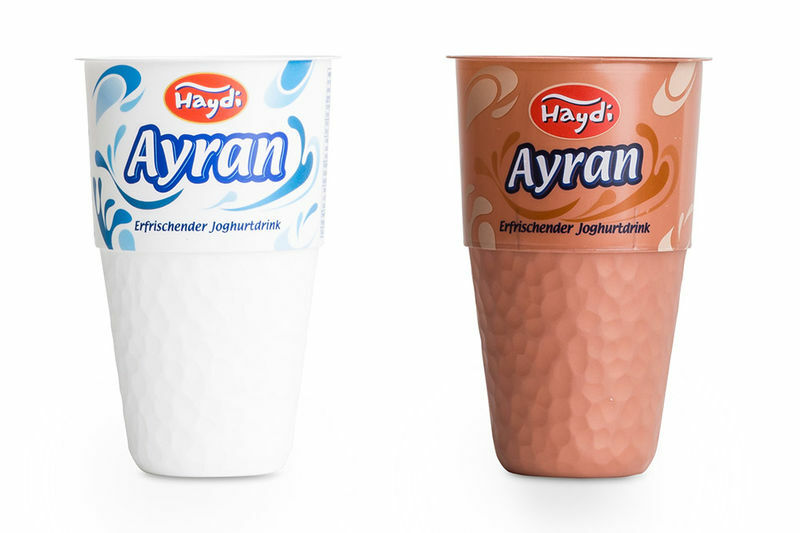 Through intensive collaboration with the customer, the Greiner Packaging team, through Despro, its in-house design & prototyping department, developed a cup that mirrors the tradition of Ayran while still appearing modern. The challenge was to base the plastic cup as closely as possible on the design of the original vessel – including the characteristic hammertone look. The indentations on the surface of the cup are – as was the case in the original vessel as well – of varying sizes; transferring this individuality to a mass-produced product required a high degree of technical know-how; likewise, there was the fact that indentations in an injection-molded cup make it more difficult to remove from the equipment. Thanks to intensive development work, however, all the challenges were overcome and the customer was impressed by the extraordinary cup design. Aside from this now prize-winning cup, which is predominantly sold via retail sale, a copper-colored cup is also in use.